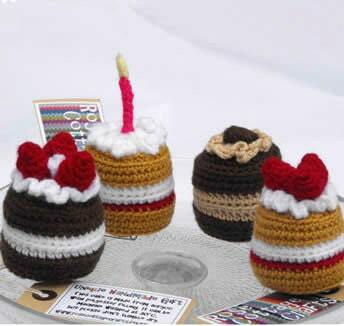 These delicious looking cakes are crocheted from 100% acrylic and are filled with polyester stuffing. They look great in any kitchen or for any child's play food set. Or are perfect for a birthday gift and are calorie-free! The cakes measure approx 6cm (2.25") across in diameter and stand approx 6cm (2.25") high (excluding toppings!). 4. Victoria Sponge with berries on top. Let me know which 'flavour' you want on your paypal payment. Custom orders are always welcome, so if you have another favourite flavour then email me info@rosecottagecrafts.net ! Or if you would like a different number or colour of candles.